Thank you for the email regarding your raspberries and blueberries. First question: do you have summer-bearing/everbearing or fall-bearing types of raspberries? If you have a summer-bearing and everbearing types of raspberry, you do not want to prune it in general. The berries will be produced on canes from the previous year. The only ones that you should think about pruning would be those that have grown up beyond the area you have designated for them, or any that are spindly or diseased. peeling bark. To force your everbearing raspberries to produce only one crop in the fall, prune back the entire raspberry bush in early spring. As the canes grow back in the summer, remove outside suckers and thin the canes to about 6 inches apart. Keep the sturdiest canes. This technique will give you a larger fall harvest and is good if you also have summer bearing raspberry bushes and you want to stagger the harvests. As the summer goes on, you can always prune out any dead, broken or diseased canes or those that are outside your designated row area. Of course, you can prune broken, dead, diseased or infested canes at any time of the year, the sooner the better. And one other thing: wear thick gloves as raspberries have some serious thorns on them. And use clean, sharp tools. As for the blueberries, spring is the best time to prune. Before domancy has broken, remove any diseased or broken wood, plus crossing branches. You want the bush to have a narrow base and a wide, open top that allows sunlight and air in. 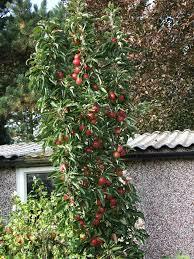 “I bought columnar apple trees a few years ago. This year they had a few branches come off the main stem. Should I prune the branches, leaving only the main stem, or are branches good to keep around for more fruit? If I should prune them, is fall the best time or should I wait until spring. Thanks. Thank you for the question regarding transplanting climbing roses. You can try to transplant the rose, but before you do, I encourage you to take some cuttings from it just in case the bush doesn’t survive the move. Late summer or early fall is the best time for taking cuttings. Select long, firm shoots that have grown over the summer and remove the soft tips. Then cut pieces about nine inches long so there are leaf buds very close to the top and bottom of each cutting. Be sure to use a sharp knife or secateur-type pruners. Remove all the leaves except the top pair, and dip the bottom ends of the cuttings in rooting hormone. Choose a site for the nursery bed that gets plenty of light but is shaded during the hottest part of the day. Then place them into a six-inch-deep trench in the ground. Firm the soil around the cuttings and water well. Leave the cuttings in the ground over the winter and water as needed. By the following autumn, the cuttings should be ready to transplant to their new home. Now, back to transplanting the bush. Choose a site in full sun, and improve the soil with organic matter. The best time to prune and move the bush is in late winter or early spring. This means that if you intend to take cuttings in the fall, you should wait until the following spring to move your bush. Using secateur pruners, remove all dead and unhealthy (brown or black) wood at ground level. Thin out the center of the plant to improve air circulation, and remove canes that cross each other. You can prune every cane back by one-third to a healthy outward-facing bud. Make the cuts at a 45-degree angle about one-quarter-inch above the buds. Dig up the bush carefully, trying to preserve as much of the root system as possible. In the new location, dig a hole about two-feet deep and a foot-and-a half wide. Make a mound in the center of the hole for the roots to spread over, and set the rose so that the bud union (the swollen part at the base of the stem) is at ground level. Fill in around the roots with a mixture of soil, compost and rotted manure. Add water. After it settles, fill in the rest of the hole. Mound the soil up around the base of the plant and a few inches out from the stem, making a trough that will catch water. Pamper the plant for the first season, keeping it well-watered. “Two years ago we planted two apple trees of same variety. Haven’t had any apples to date. Heard we had to plant another tree of a different variety for pollination. Is this true, and how close do they have to be planted to the other two trees we have already? Can we still prune the existing apple trees? Thanks for emailing in your questions regarding your apple trees. My first question is: have your trees been blooming already? For being only two years old, they may not be flowering yet (and thus not producing). Most dwarfs begin flowering in 3-5 years after planting, and semi-dwarfs and standards take even longer. It is recommended to have at least two different varieties of apple trees for successful pollination. Most apple varieties are self-unfruitful, which means their blossoms must be fertilized with the pollen of a separate variety in order to achieve good fruit set. A few varieties, are considered self-fruitful, meaning their blossoms can be fertilized with their own pollen, but even these apples produce more fruit if they are cross-pollinated by another variety. It’s important to choose varieties that have compatible pollen and bloom times. Any reputable company that is selling apple trees should have this information readily available for the varieties that they carry so you can chose which trees work best for you. Apples also need pollinators—certain wasps, flies, and bees—to transfer pollen from one variety to the other. The apple trees must be planted within 100 feet of each other in order to help ensure that the pollinators visit both trees. If you have only one apple tree in your yard or incompatible varieties, all is not lost. Crab apple pollen fertilizes apple blossoms. So if you have a crabapple in the vicinity that blooms concurrently with your apple tree, you’re in business. Grafting a branch of a compatible variety onto your existing tree is another option, though I recommend you hire an arborist to perform this job. You can also use an old, very effective orchardist trick: put a bouquet of crab apple branches in bloom in a 5-gallon bucket of water and place it inside the canopy of the tree. Then bees can visit the crab apple blossoms and transfer the pollen to the apple blossoms. In other words, a little can go a long way. 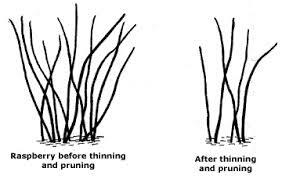 Pruning is SO important and it something that you should be doing regularly at the proper times of the year. Pruning young trees encourages a strong, solid network of branches that will be the future of your tree. Pruning on mature trees maintains the shape of the tree and encourages fruit production. The best time to prune apple trees is in late winter or very early spring when the trees are dormant and before any new growth starts. The only growth you ever want to prune or remove during the summer months, when the tree is actively growing, is a sucker. I hope this information helps you out. If you have any other questions, please feel free to ask! have to outsmart the black spot. fungus to thrive and continuously reinfect plants. protect newly developing leaves and to replace fungicide washed off by rain. fungicide use have caused homeowners to consider alternatives for control. some of the oil and reduced foliar damage. cover, proper pruning and fertilization, and removal of fallen leaves. keep a plant in optimal health, which makes it less susceptible to disease. “I’m helping a lady who bought Full Sail Tree Rose. I always deadhead roses back to a leaf of 5, so they will rebloom. Looking at the Full Sail, which usually blooms in bunches of 3, if we deadhead to a leaf of 5, that is quiet a big cut. I don’t have any hard feelings in taking the cut, but the garden owner wanted me to verify with you if that is correct with the Full Sail. If we go to a leaf of 3-that is directly under the bloom but I don’t think she will get rebloom cutting there. Please advise as soon as possible, as she will be out of town for 3 weeks, and I’m tending the gardens while she is gone. Thank you for the email regarding pruning on your friend’s rose tree. 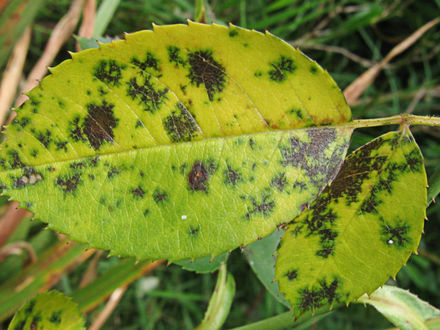 The general rule of thumb with trimming roses is the leaf of five rule. However, depending on the age, size, and manner the tree has been cared for, it is not always possible to do this without cutting off too much. In the event that a leaf of five leaflets cannot be found or cannot be used because there would be most of the tree cut off, then you can cut above any outward facing leaf. The dormant buds always grow in the direction that the leaf below the cut is pointing. Keep in mind that whenever you cut a rose bush or tree, especially when deadheading or taking roses for cut flowers, this is pruning. 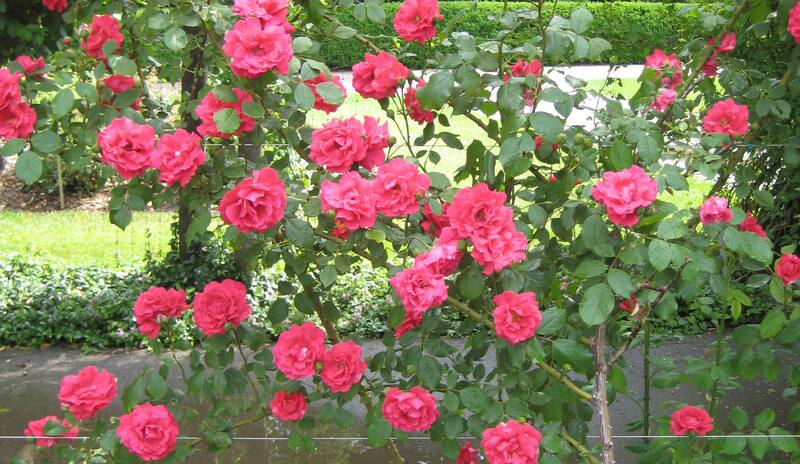 And whenever you prune a rosebush, you want to direct the new growth in an outward direction.